잡지의 디자인은 판형, 종이의 종류와 같은 하드웨어적 형태와 그리드, 타이포그래피, 사진 및 일러스트레이션 등의 소프트웨어적 형태의 크리에이티브 요소를 통해 디자인 정체성을 형성한다. 미디어의 디지털화가 진행되고 개인 미디어가 성장하면서 인쇄 매체 중심으로 콘텐츠를 제공하던 잡지 역시 디지털 미디어로의 확장을 시도하고 있다. 그러나 이 과정에서 종이 책의 형태로 출간되는 잡지 매체의 편집 디자인을 통한 정체성이 디지털 언어로 출력되는 온라인 매체의 잡지와 정체성을 공유하지 못한 채 같은 콘텐츠를 다른 형태의 편집디자인 요소를 통해 표현하고 있는 실정이다. 이에 본 연구에서는 오프라인 잡지가 온라인화 되는 과정에서 이러한 편집디자인 요소에 따라 독자들의 태도가 어떻게 달라지는가를 실증 연구를 통해 확인해보고자 하였다. 이를 위해 현재 출판되고 있는 패션 잡지를 선정하여 인쇄 잡지의 편집 디자인 구성 요소들을 적극적으로 반영한 온라인 가로형 편집 디자인과 인쇄 잡지의 편집 디자인 요소들이 거의 반영되지 않은 채 현채 실행되고 있는 온라인 세로형 편집 디자인을 실험 자극물로 제작하여 서울 및 수도권에 거주하는 20대 남녀 160명을 대상으로 실험연구를 진행하였다. 분석결과 첫째, 가로형 편집 디자인이 세로형 편집 디자인보다 주목성이 높고 가독성도 좋은 것으로 나타났다. 둘째, 독자들의 태도는 세로형 편집 디자인보다 가로형 편집 디자인에 더 호의적인 것으로 나타났으며, 구독 의향도 가로형 편집 디자인이 더 높은 것으로 나타났다. 이러한 연구를 통해 통합 미디어, 멀티 플랫폼 시대에 미디어의 브랜드 자산을 확보하고 디자인 아이덴티티를 형성하기 위한 연구에 도움이 될 수 있을 것으로 기대한다. The design identity of a magazine is formed with such creative elements as hardware (e.g. size and paper type, and software (e.g. grid, typography, photography, and illustration). As media has been digitalized and personal media has grown, a magazine whose contents have been mainly provided on print media is also trying to seek its expansion into the digital world. 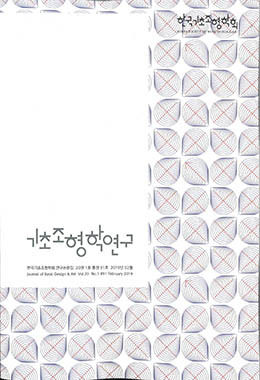 In the process of expansion, however, a magazine, whose identity is established through the editing design of the medium that is published in the form of a paper book, does not share that of an online magazine but only express it with other editing design elements for the same contents. In this respect, we attempted to examine how readers' attitude toward an online magazine is affected by editing design element in the process where an offline magazine transforms into an online magazine. To attain the objective, we selected fashion magazines that are currently in the press. And we made as experimental stimuli (i) an online magazine in horizontal layout design, which actively adopted the editing design elements of a print magazine, and (ii) an online magazine in vertical layout design, which hardly adopts the editing design elements of a print magazine. And we conducted an experiment with 160 participants (both men and women) in their 20s, living in Seoul and the metropolitan area. The findings are as follows. First, we found that the online magazine in a vertical layout design had higher attention rate and readability than that in a horizontal layout design. Second, we came to know that readers had a more favorable attitude toward the online magazine in a horizontal layout design than that in a vertical layout design. Intention to purchase was also higher for the online magazine in a horizontal layout design. We expect that these results will be helpful for a study aiming to secure media brand assets and form design identify in the era of integrated media and multi-platform.